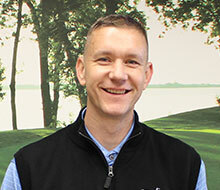 Joe Rahnis, Director of Golf Operations for Baltimore County Golf, has been golfing for 34 years. While playing golf at Chesapeake H.S., he won the Individual Championship for Baltimore County as well as participating in two National Championships while attending Essex Community College. After graduating from Towson University with a Bachelor’s Degree in Business Management, Joe turned professional and became a member of the PGA in 1996. Joe is an inductee of both the Essex Community College and CCBC Athletic Hall of Fame. Joe teaches golfers of all skill levels and ages. His greatest joy in teaching is watching his students improve and their love for the game grow in the process.